The cranial cavity, also known as intracranial space, is the space within the skull. The skull, also known as the cranium, contains the brain. Meninges are protective membranes that surround the brain to minimize damage of the brain when there is head trauma. Meningitis is the inflammation of meninges caused by bacterial or viral infections. The spaces between meninges and the brain are filled with a clear cerebrospinal fluid, increasing the protection of the brain. Facial bones of the skull are not included in the cranial cavity. There are only eight cranial bones: The occipital, two parietal, the frontal, two temporal, the ethmoid and the sphenoid bones are fused together by the ossification of fixed fibrous sutures. The occipital bone found in the rear of the skull is thicker to limit fractures caused by blows to the back of the head. 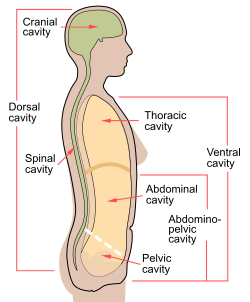 The capacity of an adult human cranial cavity is 1,200–1,700 cm3. ^ Martini R, Ober W, Garrison C, Welch K, and Hutchings RT. 2001. Fundamentals of Anatomy and Physiology, 5th ed. Prentice Hall, New Jersey. p. 195. ^ Turchin, Valentin. "The Phenomenon of Science". 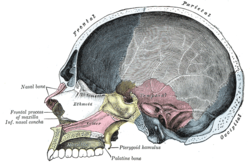 Wikimedia Commons has media related to Cranial cavity.